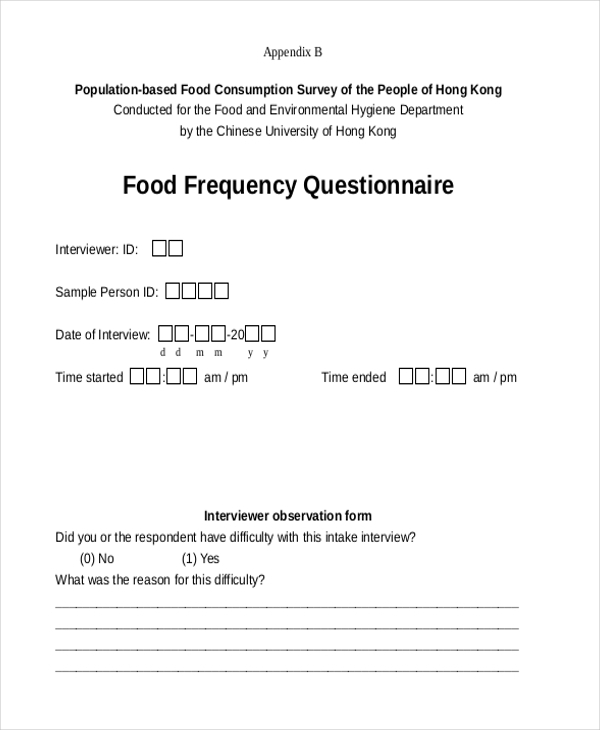 As is indicative of the name, this is a sample of a food frequency questionnaire form which can be customized as per the need of the user. However, it comprises of all the key segments that should be included in this questionnaire. This is usually used by a diabetic specialist or a dietician to understand the eating habits of a patient suffering from diabetes. This would help the doctor to help the person understand what he can eat and when. 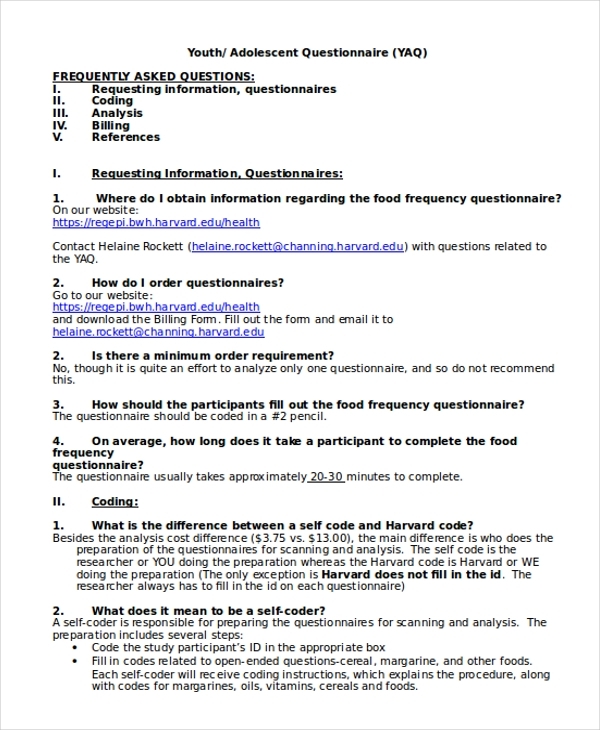 This food frequency questionnaire form is developed by Harvard experts and is usually considered as a standard for similar forms. This can be used to gauge the lifestyle of people suffering from serious illnesses or trying to lose weight. 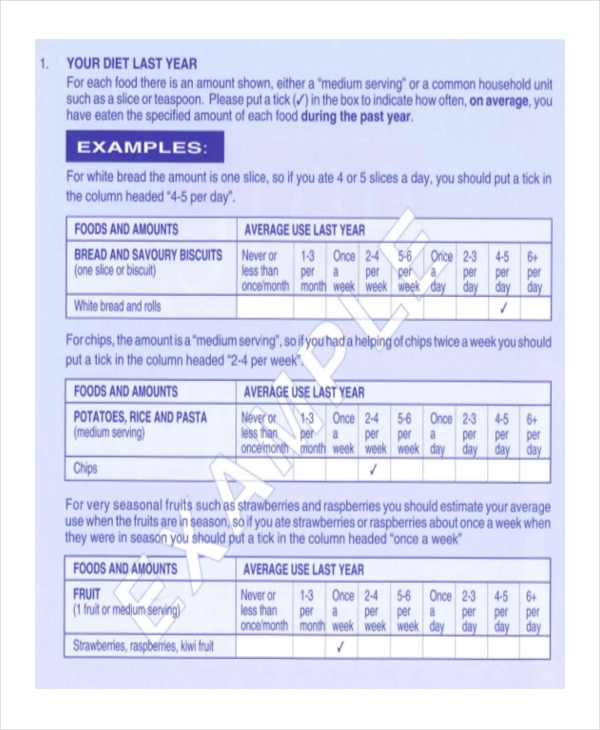 Used by pediatricians and dieticians, this form is used to understand the eating habits of the children. This gives the doctor a clear idea of the allergies the child might have or to understand underlying diet issues. 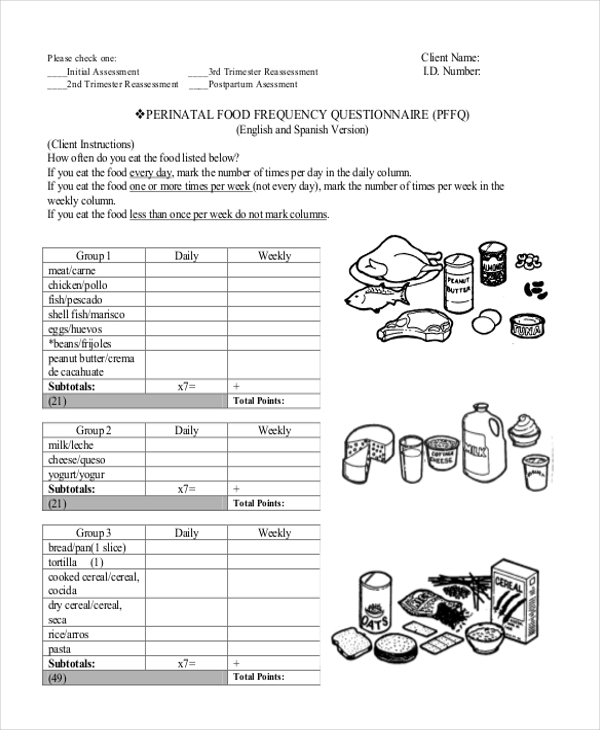 This questionnaire is used by gynecologists and obstetricians to understand the diet of pregnant women. This helps the doctor to understand the problems the expectant mother might be facing and to resolve them. 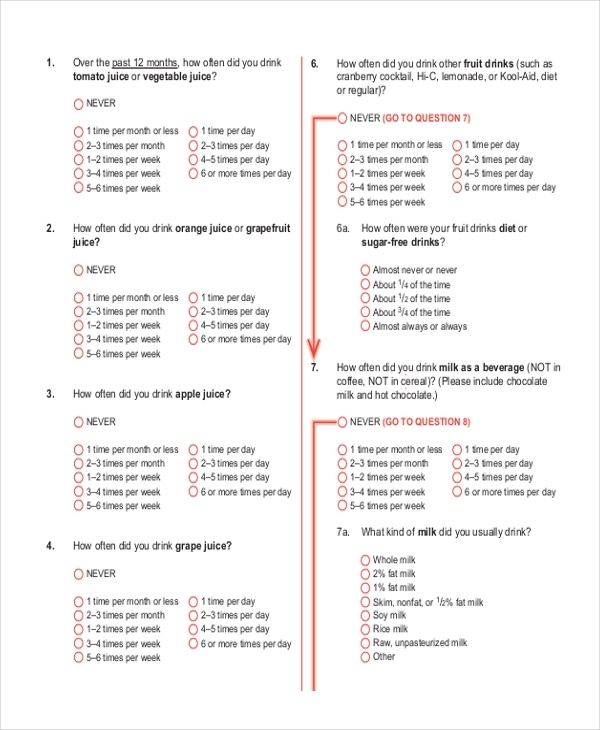 Quite similar to the normal food frequency questionnaire, this poses dietary questions to the people to gauge their eating habits and their frequency of consuming a particular food. However, it does not require them to fill in the quantity. 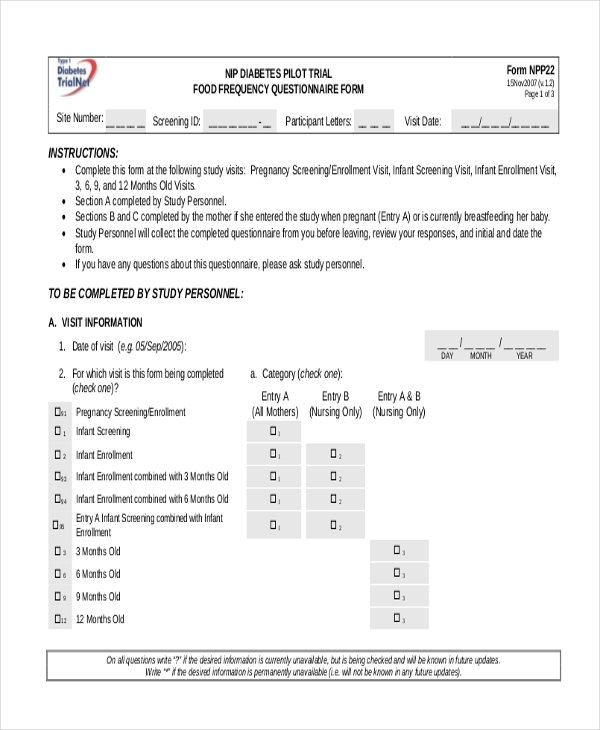 This questionnaire is mainly used by doctors, dieticians and fitness trainers to help the young people to lose weight or to zero in on allergies that they may have. This also helps them to keep a watch on what they eat. The food frequency questionnaires come in handy in analyzing the food habits of people. They use this questionnaire to find out the eating habits of their clients and patients. This helps them in assigning their patients a better diet that would be beneficial to them. They use this questionnaire to ensure that their clients eat healthy such that they can lose weight in an efficient manner. Business organizations sometimes make use of these questionnaires to find out the eating habits of people and what they prefer to eat to come up with newer products and services. Why should you Use Food Frequency Questionnaires? What are the Benefits of Using Food Frequency Questionnaires? 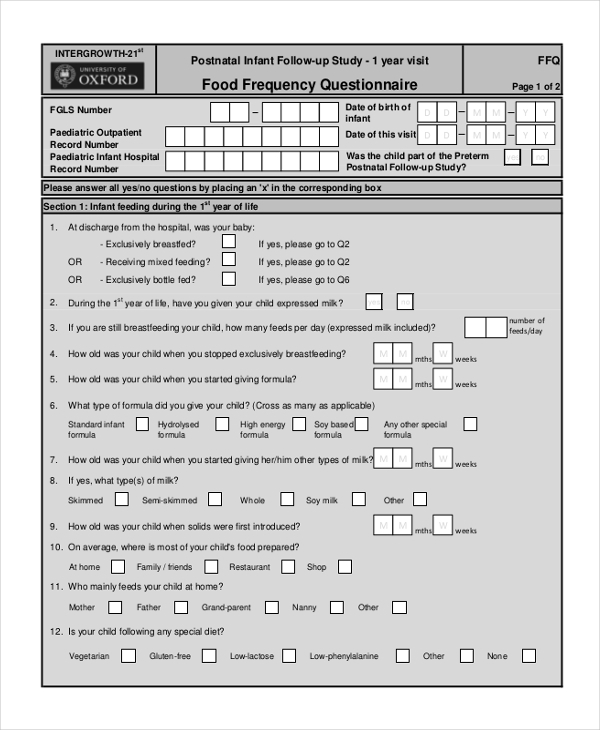 Patients find filling in food frequency questionnaire to be an easier task than answering direct questions that may be asked of them by the doctor or the dietician. Using the questionnaire also gives the doctor a document which he can add to the patient records to be referred to on a later date if required. It also helps the doctors to analyze the eating habits closely and find out if the person concerned is suffering from any food allergies. How can you Design a Food Frequency Questionnaire? Designing a food frequency questionnaire is not an easy task. It requires a lot of thought. However, with these questionnaires now being readily available online, it is definitely easier to come up with special ones for your services. All you need to do is download a questionnaire and then customize as per your requirement.